I love the flavors associated with Asian cuisine. When I was a child my mother would take me to many restaurants to sample the fare, but at home until I was almost grown she shied away from cooking with these flavors. One day when I was around twenty I went into the cabinet and the refrigerator and pulled out every Asian sounding ingredient I could find. By now my mother was stocking besides the teriyaki sauce, and soy sauce most American’s kept in their fridges – rice wine vinegars, wasabi powder, garlic-chili sauce, etcetera – but I had never seen her create something with them. I went to town not keeping track of how much of anything I was placing into a bowl. Like the first trip to a sundae bar by yourself as a child, I attempted to put one of everything on my plate. In the end the chicken I was making turned out overly salty and the sauce was too runny from lack of cornstarch and way to many vegetables – but I was excited, turned on. From them on I was hooked. Creating a new dish is a high for me. For someone other than me to actually enjoy it just puts me over the edge. I take pleasure in playing with salty-sweet combos and pushing edges on what people think they like, forcing them to try new things against their will. I have found that in many instances people are like my uncle who insists he detests the flavor of onion – but who loves everything made for him with onion that he cannot detect with his eyes. To be truthful I know nothing about the proper way to cook Asian food. I don’t have a book on it, I haven’t watched a program on it – nonetheless I continue to report back to the flavors and play around like in a sandbox, unabashedly and full of joy. 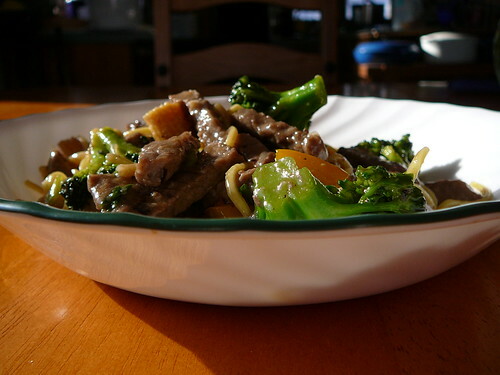 Such a playtime romp went on today as I prepared Beef with Plum and Black Bean Garlic Sauce. I simply decided on a protein and then went and looked for Asian flavors I enjoy and asked them to come over and play in my sandbox. 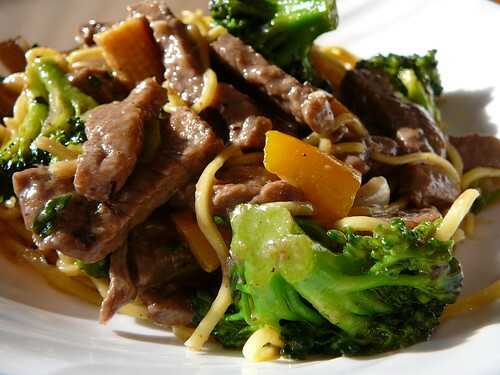 I started off by blanching my broccoli both for color and to start the cooking process. 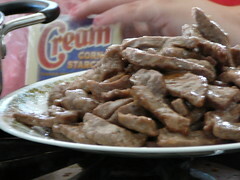 Salt and pepper beef strips and then lightly coat in flour, shake off excess. Preheat a large skillet with half the vegetable oil (use the other half for the second frying if needed) in it over medium high heat. 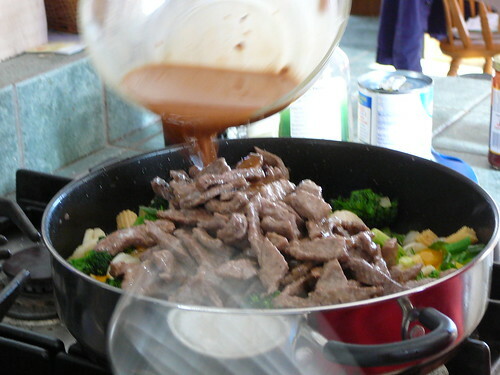 Add the beef in two batches. Brown the meat and reserve to plate for later use. At the same time put on a pot to boil for the noodles, follow the package directions for times. Mine took three minutes to cook. 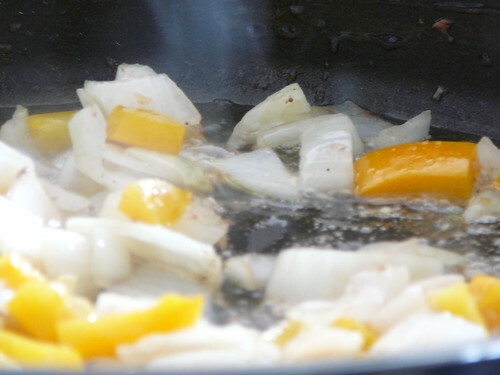 Reduce heat to medium and add the sweet onions, yellow peppers, garlic, ginger, and red pepper flakes. 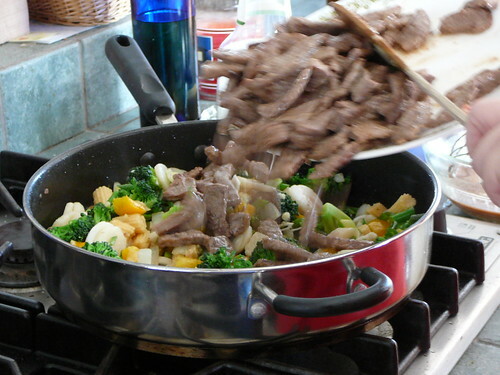 Cook for approximately 4 minutes (depends on doneness of vegetables you prefer). While the vegetables are cooking in a mix together the plum sauce, black bean garlic sauce, hot oil, sesame oil, and chicken stock. After making sure all the ingredients are incorporated whisk in the cornstarch and set to the side. 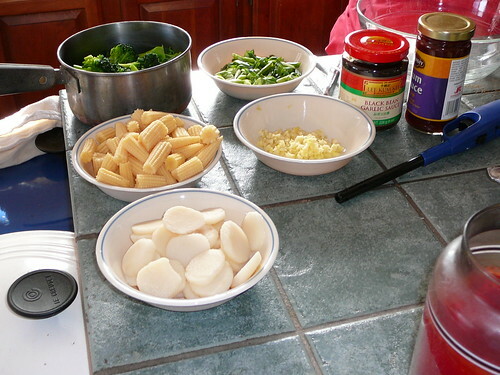 Add the broccoli, water chestnuts, baby corn, and scallions – let them cook for about one minute. and pour in the sauce. 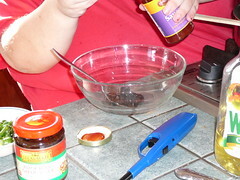 Mix and make sure each item is coated. Turn heat to low and cook another three minutes. 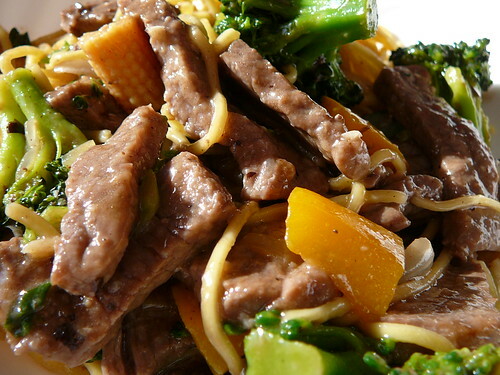 Turn the heat off, add the noodles, and toss to coat. I enjoy the mild flavors in the dish. There is nothing to salty, or to acidic as some recipes insist on using vinegars and prepared sauces that are vinegar based. I hope you try it and I hope you enjoy it, and don’t tell me you can’t find any of the products I listed in here. I checked the local Wal-Mart and if a Wal-Mart in the middle of New Hampshire is carrying all of these products – even soba noodles than I hope everyone can find them. Trust me they are worth the investment. This entry was posted in cooking, delicious, Food, food pictures, recipe, recipes, Wal-Mart. Bookmark the permalink. I love the step by step photos! I’ll have to try this recipe some time, the pictures are mouthwatering! hello what is this? hi this is lauren how r u all? wat ya been up to?